I’ve bought a new car. All that remains is to siphon out the diesel from the old one, Mad Max-style, and it can go to the big scrapheap in the sky. I made a quick trip to the wood on Sunday. I decided to visit the main sett and see if there was any sign of more badgers. I’m becoming certain that there are a lot fewer badgers in residence this year and not having been here for a while I wanted to make sure they were OK. The dry spell has ended – it seems like we’ve had torrential rain and thunderstorms every other day this week – so at least the foraging should be easier for them. I arrived at the sett just before 8.00pm, only to find my path blocked by a Chinese Water Deer browsing through the undergrowth. 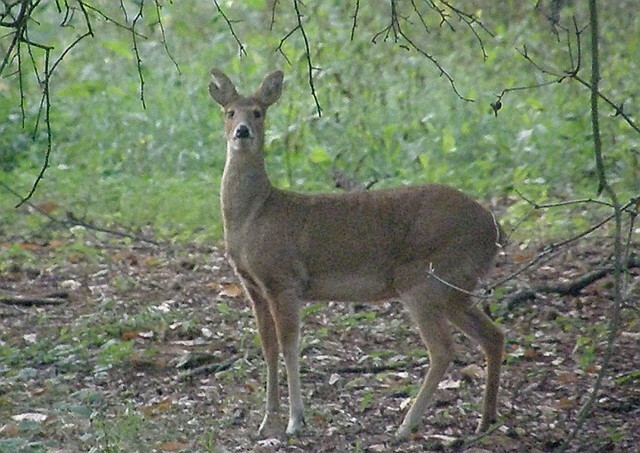 I like watching deer and they’re great fun to try to stalk in a wood. This one presented a challenge though. It was very close to the sett, so if I frightened it, it would probably frighten any badgers that were above ground. This is how it works with wild creatures: any disturbance to one tends to create a reaction in others, which is why it is so important to move stealthily even when you’re some distance from the animals you want to watch. Predictably, despite my cautious approach the deer eventually caught sight of me and bounded off. Interestingly, it had a big split in one of its ears, which should make it possible to identify in the future. I can only assume that this was caused by a fight with another Chinese Water Deer. The males have long teeth. I don’t know for sure, but I’ll bet they fight each other over territory or females, despite their cute appearance. I don’t know if the deer frightened off any badgers, but there weren’t any in sight. I sat in my tree and watched for half an hour as the light gradually faded. At 8.37 a badger emerged from the western end of the sett, showing that they’re back in residence at this end. It wandered to and fro, foraging in the damp wood. For a while it sat under my tree, directly underneath me (too dark for pictures, unfortunately). It seemed healthy and happy, not bothered by any traces of my scent in the area. After a while it ambled off into the gloom of the wood. I gave it five minutes head start and left for home. It was good to see the badger, but it was only one badger on its own. There’s nothing so far to suggest that my idea that the badgers are much reduced is incorrect.